The United States Congress designated the Eagletail Mountains Wilderness (map) in 1990 and it now has a total of 97,880 acres. All of this wilderness is located in Arizona and is managed by the Bureau of Land Management. Fifteen miles of the Eagletail Mountains' rough ridgeline runs right through the northern section of this Wilderness, including 3,300-foot Eagletail Peak which rises from a low point of 1,100 feet within the Wilderness boundaries. Cemetery Ridge lies along the southern border. Geology buffs can examine several distinct rock strata throughout these mountains, and everyone can marvel at such geologic wonders as natural arches, high spires and monoliths, jagged sawtooth ridges, and numerous washes between six and eight miles long. Courthouse Rock, a huge granite monolith, stands over 1,000 feet above the desert floor near the northern border and attracts technical rock climbers. Between the two main ridges stretches a vast desert plain of ocotillo, cholla, creosote, ironwood, saguaro cactus, barrel cactus, Mormon tea, mesquite, and sand. Summer temperatures rage and send up thermals upon which raptors ride as they scan the landscape for a desert rodent snack. The great horned owl and the coyote live here, but they keep themselves well hidden from backpackers, campers, and horseback riders. Temperatures can be as low as 30° Fahrenheit from December through January and can reach above 115° Fahrenheit from June to September. Precipitation generally ranges from 2 to 4 inches per year. Rainfall, which can occur at any time of the year, is often preceded by strong and sudden windstorms. Watch for cloud build up and be aware of possible flash flooding in washes and drainages. 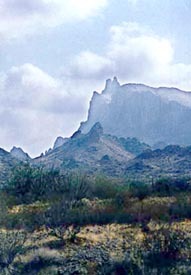 Planning to Visit the Eagletail Mountains Wilderness? How to follow the seven standard Leave No Trace principles differs in different parts of the country (desert vs. Rocky Mountains). Click on any of the principles listed below to learn more about how they apply in the Eagletail Mountains Wilderness.